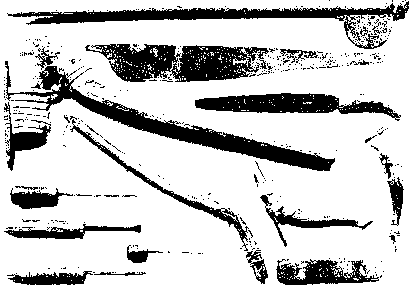 New Kingdom carpenters had an extensive tool kit and equipment to draw upon (figure 50). They used axes, large and small adzes, pullsaws and handsaws, bow-drills, mortise and firmer chisels, mallets and awls. Egyptian carpenters, like their modern counterparts, used a hone to sharpen the cutting edge of their tools. It was made from slate and usually had a hole bored at one end which allowed it to be hung on a peg somewhere in the workshop. 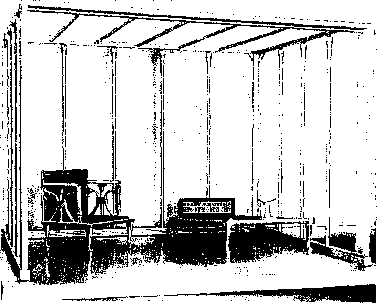 The centre of the hone would become dished by the repeated honing action. Many marks can be seen along such hones while a few run across them, these marks being made by the carpenter when, after sharpening the blade, he turned it over on to its flat side to wipe away the burr (figure 50). was a wooden spout formed in the shape of a spoon. A length of cord would have been attached to both ends of the oil flask, allowing it to be hung up, perhaps with the hone (figure 50). The straight edge, used to test that the timber was true, was also part of a carpenter's equipment. 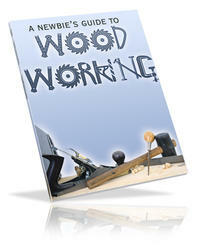 The New Kingdom carpenter in figure 51 is preparing and squaring lengths of seasoned timber. He sits on a dished stone seat and works at a wooden bench. This is made from a log that has been specially worked and rebated across the front to help him saw lengths of timber. He has safely placed his adze in the top of the bench to protect his fingers and feet from the cutting blade. Also shown is a try square, the stock and blade of which would have been made from wood. To help him cut angles on timber, he had a mitre-cutting aid, which is shown behind the bench.